Bats are quite remarkable animals worthy of our interest and respect. They are the only mammals capable of controlled flight - and their aerobatic skills have to been seen to be believed! There are eighteen species of bat in Britain and all are protected under the Wildlife and Countryside Act. One of these species, the Greater mouse-eared bat was officially declared extinct in Britain in 1990, but there have been reports of sightings across 29 locations in the UK in the winter of 2011/2012. Bats are quite remarkable animals worthy of our interest and respect. They are the only mammals capable of controlled flight - and their aerobatic skills have to been seen to be believed! British bats eat insects and nothing else. This makes them valuable friends and allies as many farmers and gardeners seek to reduce insect numbers, as some insects can cause damage to valuable crops and flowers. Bats have their own exclusive Order which is known as Chiroptera (meaning hand wing). They have been separated from the other insect eaters because of their ability to fly. The 'hand-wing' description is very apt, as one can see when studying the structure of a bat's wing. The bones which support the wing membrane are simply extended 'fingers', with the thumb forming a protruding hook. If we stretch out our fingers as wide as possible and then imagine the skin between them extending out to the finger tips, this will provide some idea of the bat's wing structure. While the front limbs of the bat have been specially developed for flying, the hind limbs look quite insignificant and almost useless. However, the hind limbs are essential to the bat when it comes to roost, as it hangs upside down from its chosen resting place with its hind legs acting as a firm anchor by gripping whatever object or surface is available. The most common bat seen in Britain is also the smallest of our 18 species and it is known as the pipistrelle. This little bat (wing span about 22 to 25cm) is often mistaken for a dusk-flying bird as it flits among the trees and hedgerows seeking insect prey. 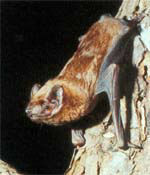 Among the larger bats are the noctule (wing span up to 38 cm) and greater horseshoe bat, with a wing span of similar size. Bats are difficult to identify in flight as one does not get much opportunity to observe them properly, but the pipistrelle can usually be recognised by its small size, while the long eared bat's ears can be spotted if the light is not too bad. Although bats have reasonable eyesight they catch their food (flying insects) by using a remarkable form of 'radar'! As the bat flies through the air it emits a series of ultrasonic squeaks (about 12 - 15 per second). These high-pitched sounds are usually out of range of human hearing, although some lower frequency calls are certainly audible. The sound waves from each squeaking call are projected out in front of the flying bat. As these sound waves come into contact with objects along the flight line they bounce echoes back to the bat's receiving gear - so allowing the bat to avoid obstacles or to home in on insect prey. Our bats are divided into two distinct groups. The twelve species of earlet bats have a long ear post, or tragus, through which they receive their echo signals. The other two species are known as horseshoe bats. The greater and lesser horseshoe bats have a strange horseshoe-shaped growth on the nose. As a horseshoe bat flies it utters ultrasonic squeaks through its nose. It does not move its head but moves the parts of the nose to change the direction of the sounds. At the same time the bat waggles its ears backwards and forwards, up to 60 times a second, in order to receive the echoes.